By all appearances, the recent disclosures regarding the moon seem to be yet further subtle revelations of the greater developments occurring in space. In the last five to seven years, the corporate media has been pushing out what appears to be their own manicured version of disclosure. These partial revelations introduce the public to concepts and possibilities which established science has previously refused to consider. Such concepts may be interesting for the largely uninformed to ponder, but to those of us who are familiar with the greater extent of possibilities in space, these topics can be a significant tease. According to several reputable whistleblowers, the moon is not simply a prospect for future construction and colonization, but has already been built out, developed and occupied several times over. Generation after generation of technological developments have been discovered within lunar ruins, and as various missions to the moon have progressed, further advanced Earth technologies have been used to improve living conditions in space. The endeavors of these operatives all exist under the umbrella of what much of the truth community knows as the Secret Space Program. According to testimony, this collection of space programs was formed and operated long before the public version of the space program ever came on the scene. In fact, according to whistleblowers, the public space program headed by NASA was actually created to be a cover for the other highly advanced operations taking place around the Earth, on the moon, and on multiple other planetary bodies. Here is the SETI Institute with a discussion about lunar lava tubes. Notice how suggestive the discussion is with regard to possible utilization of these caverns by various space programs and personnel. 11 January 2018, Mountain View, CA –The SETI Institute and the Mars Institute announced today the discovery of small pits in a large crater near the North Pole of the Moon, which may be entrances to an underground network of lava tubes. The pits were identified through analysis of imaging data from NASA’s Lunar Reconnaissance Orbiter (LRO). If water ice is present, these potential lava tube entrances or “skylights” might allow future explorers easier access to subsurface ice, and therefore water, than if they had to excavate the gritty ice-rich “regolith” (surface rubble) at the actual lunar poles. The discovery of the candidate lava tube skylights in Philolaus Crater is being presented by Lee this week at NASA’s Lunar Science for Landed Missions Workshop convened by the Solar System Exploration Research Virtual Institute (SSERVI) at Ames. The meeting aims to examine the range of scientific investigations that could be conducted at a variety of future landing sites on the Moon”. 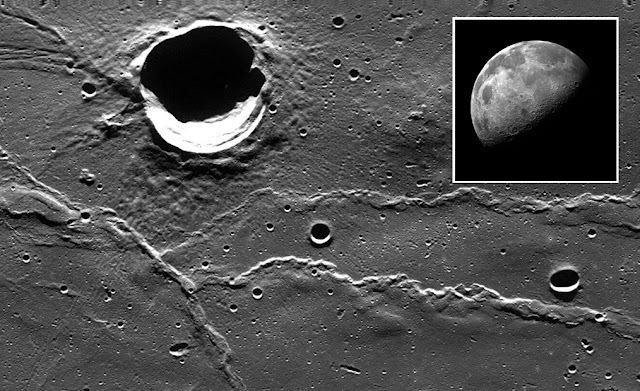 Prior to this discovery, over 200 pits had been found on the Moon by other researchers, with many identified as likely skylights leading to underground lava tubes associated with similar sinuous rilles. However, today’s announcement represents the first published report of possible lava tube skylights in the Moon’s polar regions. In recent years, the lunar poles have grown in strategic importance for both science and exploration, as water ice is known to be buried in the lunar regolith in permanently shadowed areas at both poles. But with no known large cavity allowing easy access to the lunar polar underground, and often no nearby access to solar power, extracting water ice scattered in lunar polar regolith presents a substantial challenge. The new discovery opens an exciting prospect: potentially much easier access to - and extraction of - lunar polar ice. Three factors could help: 1) skylights and lava tubes could provide more direct access to the very cold polar underground, alleviating the need to excavate vast amounts of lunar regolith; 2) if ice is present inside the lava tubes – which is not yet known - it could be in the form of massive ice formations as often occur in cold lava tubes on Earth – instead of mixed-in within lunar grit, and 3) solar power would be available nearby, just outside each skylight. 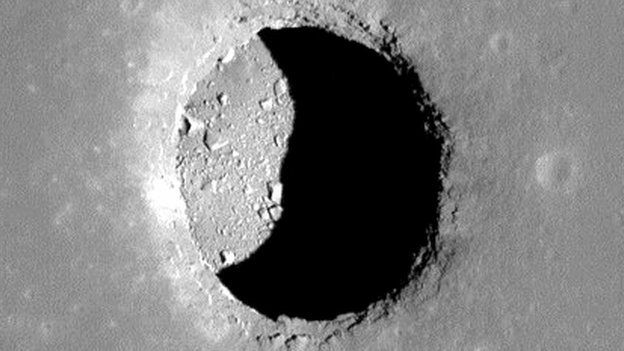 Philolaus Crater is additionally appealing due to its relatively young age, which would allow studies of the Moon’s more recent evolution. It is one of few large craters formed during the Copernican Era, that is, within the last 1.1 billion years or so of lunar history. Also, being on the near side, Philolaus affords direct communications with the Earth. “We would also have a beautiful view of Earth. The Apollo landing sites were all near the Moon’s equator, such that the Earth was almost directly overhead for the astronauts. But from the Philolaus skylights, Earth would loom just over the crater’s mountainous rim, near the horizon to the southeast” adds Lee. “This discovery is exciting and timely as we prepare to return to the Moon with humans” says Bill Diamond, president and CEO of the SETI Institute. “It also reminds us that our exploration of planetary worlds is not limited to their surface, and must extend into their mysterious interiors”. When we see suggestive disclosures such as these, it is easy to imagine how the information could be used to groom humanity to think outside the typical Earth-based paradigm. When we consider the reality of deep underground caves beneath the lunar surface, it becomes easier to consider the possibilities of utilizing these caverns for some type of base. In fact, the next article by BBC proposes that exact idea. As we read, we might keep in mind the fact that numerous credible whistleblowers have testified that the operation of a lunar base is not only possible, but that it has been the reality for over half of a century. Natural tunnels known as lava tubes could safely house permanent bases on the Moon, scientists have said. The underground volcanic structures have previously been proposed as ideal sites for human settlements. Scientists have now assessed how stable these features might be, and found that tubes of 1km in size and bigger would be structurally sound. They could protect against the challenges posed by the lunar environment. Details of the work were presented at the 46th Lunar and Planetary Science Conference (LPSC) in Texas. Unlike Earth, the Moon lacks a thick atmosphere and magnetic field to protect it against cosmic radiation. The absence of an atmospheric buffer also means that the Moon's surface receives more frequent meteorite impacts and more extremes of temperature. For example, the Moon's surface temperature can vary by several hundred degrees C during the course of a lunar day. But housing bases underground, inside lava tubes, could offer shielding against these risks. The lunar tunnels are expected to be larger than those already discovered on our planet, because of the Moon's lower gravity. 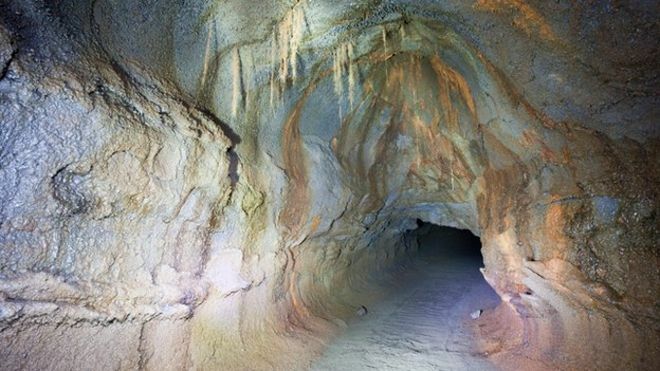 No-one has yet definitively discovered an example on the Moon, but spacecraft have revealed cave entrances called skylights that may open into lava tubes. Using existing data, David Blair and colleagues from Purdue University in West Lafayette used computer modelling to determine the stability of lunar lava tubes with different widths, roof shapes and roof thicknesses. "It's the first modern re-assessment of how stable these can be," he told BBC News. He found that tunnels with widths of 1km and greater could remain standing beneath the lunar surface. In his poster at the meeting, he displayed a diagram showing his home town of Philadelphia sitting neatly within a lava tube with a width of 5km - which was found to be the rough theoretical maximum for stability. The underground structures are thought to have been formed during basaltic lava flows during the Moon's history. When the upper layer of a lava flow cools and hardens, molten rock may continue to flow beneath it. Once this drains, it can leave behind a hollow space. The various partial disclosures which have come forward in recent times are particularly focused on delivering multiple portions of the truth to the public without any actual forthrightness about the rest of the story being shown. This has caused particular frustration for those in the truth communities, as many truthers look forward to true honesty from corporate media. According to further testimony from reputable whistleblowers, SSP operations involved the use of highly advanced spacecraft and technologies—none of which would be familiar to the average Earth human. The closest example we might have on the surface would be in various science fiction movies. According to whistleblowers, the off-planet population ranges well into the millions. These people are military personnel, corporate contracted specialists of many different professions, and slaves who had no choice in their participation in these programs. This collection of people form what is now known as the collection of Earth breakaway civilizations. They have their own colonies, cultures, and resources completely separate from those of Earth and there is no contact between these civilizations and Earth-based humanity. These projects have been in operation since the end of World War II, according to whistleblower testimony. It was actually the Nazis who first developed the means to escape Earth's atmosphere and venture out into the solar system and as they did, they found what several former operatives describe as advanced ruins of ancient civilizations all over the solar system on moons, and other planetoids. These ruins appeared to have been constructed by a highly advanced civilization that occupied the solar system thousands and possibly millions of years ago, according to testimony. The interesting aspect of these ruins was that it appeared as though multiple different groups had—at one point or another—occupied these structures for a time and then vacated these facilities later on. This seemed to be the case, as there were multiple different types of writing of different sizes and which gave different readings when dated. The moon itself offered a plethora of information to SSP scientists for extended study. Though, according to testimony, there were very few if any examples of technology that actually worked found on the lunar surface; there were numerous buildings and structures—some of which were occupied. According to whistleblowers, the Nazis were able to leave the Earth specifically because they had help from a particularly notorious ET group. This group was stationed on remote locations in space and beneath the Earth's surface at the time, and was also in operation on the moon. According to briefings about the first NASA mission to the moon, the astronauts did not simply land on the moon. These astronauts actually met these ETs on the lunar surface and were told to leave. They were allowed to take their samples and their measurements, but afterward, they were told to vacate and not to return (at least not until Earth humanity had gotten its act together). Following the Apollo mission to the moon, the real story of the lunar landing was falsified and a fake production of the lunar landing was created in order to satisfy the public interest of the NASA program while hiding the truth about the ETs the astronauts met. This is what took place during the Apollo missions, according to multiple former operatives and witnesses to these projects, and this is how the public has largely been kept in the dark about the true story of the moon. As with many accounts about SSP operations, the greater the details within these stories, the more amazing these account become. However, it is natural that some who hear these stories may find them difficult to accept. There have been disclosures of teleportation technologies, highly advanced communication systems, futuristic food production, ET life and communications therewith, hyper-advanced spacecraft and the missions they perform in deep space. There have also been numerous developments and disclosures regarding efforts to make these technologies and knowledge available to the whole of Earth humanity. The major issue with these efforts is that the criminal group known as the Cabal must be eliminated prior to these revelations so that the changes brought by disclosure cannot be hindered by attempted sabotage.